Having had loads on my plate for weeks, it’s my first time to get back near a computer to properly write for StrettyNews.com. And I’ve walked in to a minefield. 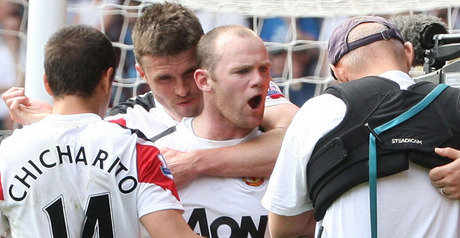 So, what do we all make of this whole Wayne Rooney debacle? Personally, it’s a disgrace that the media are using him as a scapegoat. Again. I understand that Wayne shouting expletives at the camera is hardly the greatest example to set to kids, and don’t get me wrong, I don’t condone it in the slightest. However, the fact that within hours of the final whistle he’d released a statement apologising, and has told plenty of sources at the club he regrets his actions, should have led to that being the close of the case. But alas, the wonderful FA step in again. Having already banned Ferguson for five games, putting him in the stands for the whole of April, they do this to us. Now I’m not saying it is, but strange how the FA have time and time again attempted to screw United’s title chances, isn’t it? Just a theory…. But with Wayne being banned, does this open even further debate? Why, as Stretty pointed out earlier in the week, was Steven Gerrard able to get away with sticking two fingers up to the face of referee Andre Marriner? No investigation, no ban, no apology. Or how about Manchester C*ty’s Micah Richards, swearing live in front of millions in a BBC interview? No investigation, no ban, no apology. And then there was one of our own, in Edwin van der Sar. His expletives appeared after saving the penalties in Moscow in 2008. He apologised, but again, there was no investigation, and no ban. If you’re gonna penalise one, you have to penalise them all. What about Neil Warnock’s alleged comments regarding El-Hadji Diouf? After breaking Jon Mackie’s leg, there was indeed an FA investigation. But no ban, and no apology. Probably the worst of the lot was Joe Kinnear, in his Newcastle period. His four-letter tirade towards the Daily Mirror’s Simon Bird was publicised across global media outlets. Guess what? No investigation, no ban, and no apology. Then again, Didier Drogba’s rant to the cameras after the game against Barcelona in 2009 was met by a UEFA ban. So it shows it has been done before. We’ve also had these useless Twitter bans, notably to Ryan Babel. But surely this is where the use of personal thoughts and ideals come in? When the FA rule the roost, and ban people from having their own views, it becomes an issue. Bring us right back to Ferguson, and his ban. Something has to give. You hand out bans to all, or bans to none. Not only is this outing the FA as stuck in the Stone Age, but it also opens the debate to FIFA and UEFA to enforce these rules and legislation’s, and to push for each national FA to make sure this isn’t an issue in the first place.